The connected world we are advancing into is an incredibly exciting one, with the Internet of Things making us more and more tethered to each other, our devices and the Internet on a daily basis. 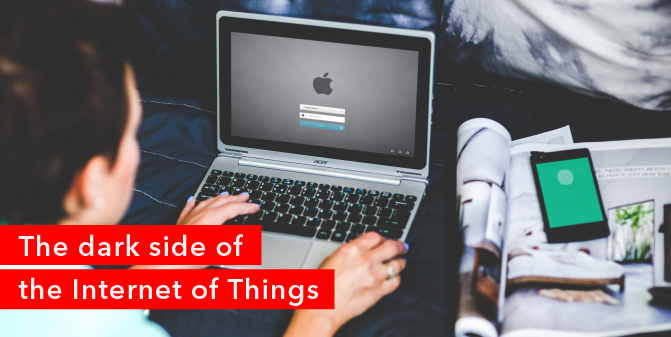 The potential of the Internet of Things is enormous and its full impact is still being unlocked by individuals and companies every day, with many companies starting to build products and strategies around IoT. But below the surface of these incredible advancements lurks something quite dark and potentially sinister. As Clark Kent knew all too well, ‘with great power comes great responsibility’ and while the Internet of Things provides untold power in how machines can talk to each other and enhance our day-to-day lives, we should take heed in our unquestioning trust in our devices. The Internet of Things relies on the Internet to connect devices to each other in order to talk to and communicate with one another. This has had a massive effect on many daily elements that we take for granted such as management of thermostats and maintenance of cooling systems via remote devices, city water management, traffic lights, hospital patient management, paperless payment systems, ATMs, some of our cars even use the Internet of Things to navigate and drive. Now imagine if someone were to hack into one or more of these systems and shut them down. Turn off all the power within a city. Change the red light to a green one without warning, turn your car off while driving at 100km/h. Your reaction would probably be one of shock and then terror. Very quickly this type of situation could spiral out of control – causing mayhem and the potential of massive losses both financially and in terms of damages to machines and infrastructure. No buildings will have been destroyed, no bombs exploded, no money stolen and yet the threat is very real. It was hard to fathom this type of situation when we are constantly told to trust that the devices we bring into our lives are safe, only to find that many of them aren’t. On a higher level many government departments are wholly unprepared for such attacks happening, having never had to defend ourselves from such a situation in the past. For now we need to ask (beg) IoT device manufacturers to build security conscious products that reduce the amount of personal data a device collects in order to protect users as best possible. And in the meantime, we encourage you to improve your security by ensuring that all of your devices have strong passwords that are changed regularly and that you try to be as security conscious as possible at all times. For an insight into how things really could go terribly wrong read this futuristic article from New York Mag and this article from Wired.com.